The Delaware State Courts are committed to supporting and participating in programs designed to enhance the public's understanding of the law and our legal system. This website includes information about the Delaware State Courts, educational and outreach programs offered by the Courts, and information about other law-related educational resources and programs, both local and national. Visit Educational Resources for websites that provide information about our legal system, careers in the law, lesson plans, and more. Visit Kids' Pages for kids' websites, activities and games. Visit Programs for the Community to learn more about programs for the general public. Court Facts - Visit Courts to learn more about the jurisdiction, judicial officers, history,governance, hours and locations and programs of each court in the Delaware State Court system. 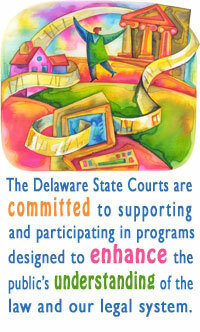 Obtain a printable brochure about the Delaware Courts. General FAQs - Visit the Delaware Courts FAQs page to answer your questions about a wide range of topics. How To Topics - The Delaware Courts Online Citizen Help Center can help you to find assistance and information, to work better with an attorney, and to represent yourself in some legal matters. Find out how your school or group can schedule a courthouse tour. Additional links to court and criminal justice information and legal research sites.